Rhea Haggart Costello, a painter and ceramic artist, will be the featured artist at the Paul Nigra Center for Creative Arts’ 2018 Fulton Montgomery Art Show. 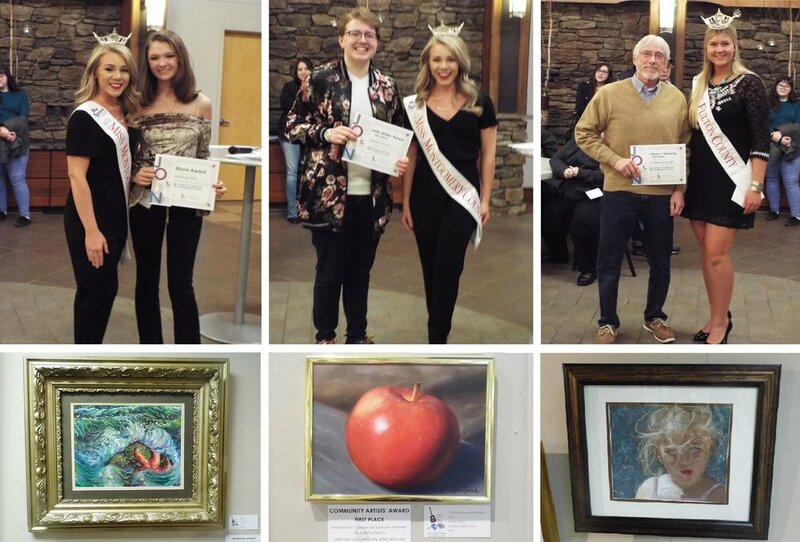 Her pieces will be displayed alongside work from artists who live and work in Fulton and Montgomery Counties as well as the work of students from the region’s elementary, middle and high schools. Originally from New York, Rhea saw her first glimmer of wonder in the glittering Tappan Zee Bridge on the Hudson River, which she could see from her family’s apartment. From there they moved to upper Westchester County, where the backyard was a wonderland of woods and brooks to explore. Art was a constant presence in Rhea’s childhood. Rhea moved with her family to northern California in 1970, when she was 13. Her journey as a serious artist started there, as art classes became her sanctuary and she focused on her craft. Rhea credits her upbringing in the open skies of California for inspiring the characteristic and oft-praised depiction of light in her paintings, but also believes that “anywhere an artist travels adds to their mind’s eye of light, color and composition.” In addition to many beautiful places in the United States, Rhea has had the opportunity to visit Italy, Greece, Germany, France and Switzerland. In 1978, Rhea moved back to New York, to the Adirondack Mountains that have provided a backdrop for so much of her work. She continued perfecting her art while working at other occupations and teaching private art classes. Teaching gave Rhea an avenue for growth in her own work as well as a network of friends who encouraged her to take it further. She took their advice, and in 2001 Adirondack Rustics Gallery became the first to accept a piece of her work. The piece sold within two weeks. That first sale started a momentum that has carried Rhea through the past 17 years. Work sold quickly to homes across the country, and Rhea worked continuously to produce detailed, “experiential” art on commission. She became involved with Adirondack Experience’s Rustic Furniture Fair, collaborating with woodworkers to embellish their furniture and commissioning them to build unique rustic frames for her paintings. Since 2005, she has been one of five painters juried into the Rustic Furniture Fair, as well as a returning artist in residence. She was also invited to show work and be an artist in residence at the Lake Placid Lodge. After the original Lodge was lost to fire in 2005 and re-opened in 2008, she worked with John Graham to produce its signature painting and The Cabin Collection. In 2015, Graham invited Rhea to be an artist in residence and instructor at Twin Farms, where she created landscapes of the beautiful Vermont property as well as a special style bowl for Chef Nathan Rich. Other commissions of note include the signature painting Rhea produced for Clear Path for Veterans in 2011 and artwork The Point requested for their 80th Anniversary. Along with those previously mentioned, Rhea has also exhibited original work and prints at the Adirondack Museum Rustic Furniture Fair, William Coffey Gallery, Adirondack Rustic Expo, Southern Adirondack Art Show, Gold Mountain Gallery, Old Forge Center for the Arts, Adirondack Living Show, Adirondack Art Society Show, Western Design Conference in Cody, Wyoming, and many more galleries and shows. Rhea’s landscapes and wildlife oil paintings exemplify the Adirondack Rustic Art genre. Her style combines intricately orchestrated detail with subtle open space to create the movement and silence found in nature. Working in the studio allows Rhea the time for this meticulous work, but she is also an enthusiastic plein air artist. When she paints in nature, her brush flows loosely to capture the essence of the day and place she experienced. Rhea’s work is her own vision, resulting from the time spent studying the beauty of the outdoors, but it has been compared to the Hudson River School artists. Her paintings are often finished with unique natural-edged frames made by her son, Larry Costello. The first time Rhea touched clay was in December of 2013. Her incentive for taking pottery lessons was to find a new canvas on which to print original oil paintings, through ceramic decals. She couldn’t find pottery that matched her vision, so she decided to try to make her own. “At that first class, I felt the overwhelming sensation of my hands opening to a new ability, as well as the discovery of a life-altering gift,” Rhea said. In January of 2014, after only three classes, she bought her own wheel and set up a pottery studio in her own home. A kiln followed that February and she began spending every spare moment experimenting and discovering her own unique style. The idea of creating decals faded fast as she developed a look that celebrated the clay’s natural structural beauty. Rhea’s ceramic work combines throwing pottery with carving to create imitations of leather and metal paired with sculptures of animals and elements of nature. She has sold countless mugs, pitchers, pie plates, vases and bowls to buyers around the country, as special gifts and collector’s pieces as well as for simple everyday use. Rhea’s paintings and pottery together tell their own biography of Rhea’s life. Her history is not only contained in a progression of education and exhibits, but also in the everyday life of immersion in her work and joy of discovering new techniques. Her work reflects hours of hiking with her son and dogs, or staying up late into the night at her easel or sculpting pedestal. The concentration of intricate detail in her work, such as sparkling light shining through leaves, pebbles lying under the flow of a brook and snake-like roots coiling at the base of a tree, speaks as much to Rhea’s lifetime as an artist as it does the grand scale of her subject – the natural beauty that inspires her to devote long hours in the studio in the first place. The Fulton Montgomery Art Show will run from April 11 to May 14 in the Nigra Arts Center’s gallery at 2736 State Highway 30, Gloversville. The public is invited to an opening reception on Thursday, April 19, 6-8 p.m., to meet Rhea and the other artists and view the works free of charge. After the opening reception, the public is welcome to view the show throughout its run weekdays 9 a.m. to 6 p.m. and Saturdays 9 a.m. to noon, for a $5 admission fee. For more information, visit www.pncreativeartscenter.org or call (518) 661-9932. For more information about Rhea, see www.facebook.com/rheacostelloart or www.paintingsbyrhea.com. March 22, 2018 /Lexington - Fulton County Chapter, NYSARC, INC.